In Una lama di luce we left Montalbano and Livia stunned by the death of François, the central character in Il Ladro di merendine, the little boy that Livia had wanted to adopt. Livia is still in Boccadasse and pours out her sorrows in long phone conversations with Salvo. Then one gloomy morning a call from Fazio interrupts Montalbano’s nightmare and draws him into a new investigation. It has been raining hard in Vigàta for several days. The storms have caused floods that have swamped houses and land, creating a sea of mud. A man called Giugiù Nicotra has been found dead on a building site. He is half naked and has been shot in the back. He had fled into a kind of tunnel formed by some large pipes meant for the water mains. The investigation gets off to a slow start, but all the evidence points to the world of building sites and public contracts. A world just as slimy and impenetrable as the mud on the building sites. 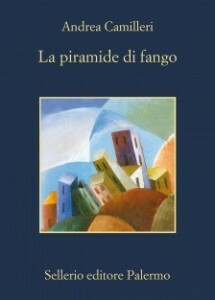 As he wades through this muddy world in which builders, construction firms and public officials thrive, Montalbano is obsessed by one thought: that by going to die in the tunnel Nicotra had been trying to communicate something.